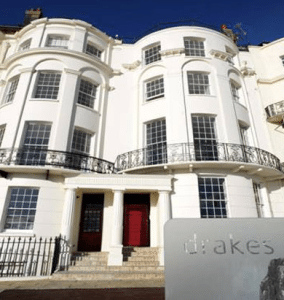 2015 Good Food Guide, Drakes has a growing reputation for high end, refined, exceptional food. I was lucky enough to visit Drakes on a Thursday evening with a friend. I was there to try their gluten free offerings and it’s safe to say I was excited! It was my first time to visit the restaurant, located on Marine Parade near the Brighton wheel on the seafront; and after finishing a busy day at work and stopping for a quick cocktail at a lovely cocktail bar down the road, my friend and I wandered down for what was soon to be a memorable evening. Feeling slightly under dressed as we had just finished work, we were seated in the private dining room on this evening as there was a function booked in the main dining area which was fine. The private dining room can seat up to 12 people altogether, so it was nice and cosy, but still didn’t feel cramped or isolated at all. After being brought menus, water, and feeling settled at the table we soon forgot our worries about our outfits and we both started getting excited about our meal. 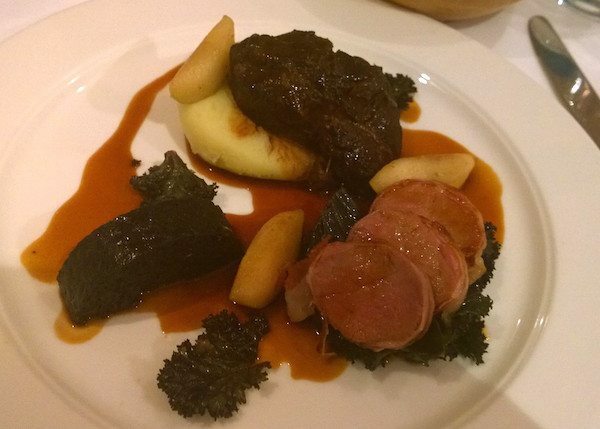 Drakes is all about using fresh, local ingredients with robust flavours and characterful dishes. The restaurant is intricately designed, with white linen table cloths, exposed brick work and fresh lighting, while still feeling flattering and comfortable to dine. We were brought a glass of bubbles straight away which was a beautiful, pink sparkling wine from Sussex called Blue Bell. It was sweet and sharp, but had a rounded finish, and it was a welcoming introduction to our evening. We were given the 3 course menu to look at for the evening, (which I think is really good value) at £45 for 3 courses as you will soon read below. Our waitress ran through the menu for me and explained which dishes can be made gluten free; as everything is made from scratch in house most dishes can be made suitable, and it is best to let the staff know when booking so they can go through the menu with you when you arrive. It’s great that they are so flexible with their menu, as it’s nice not being so restricted when choosing what to eat! After much discussion about which delicious dishes we were going to try, my friend and I finally decided and we were feeling content with our choices. 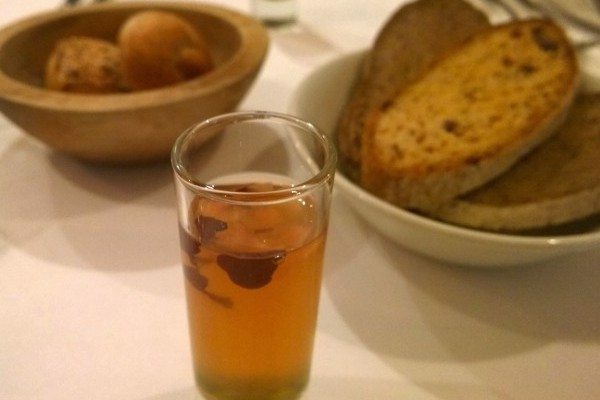 Shortly after we were brought a gorgeous tomato and pea consomme, and some bread for the table. 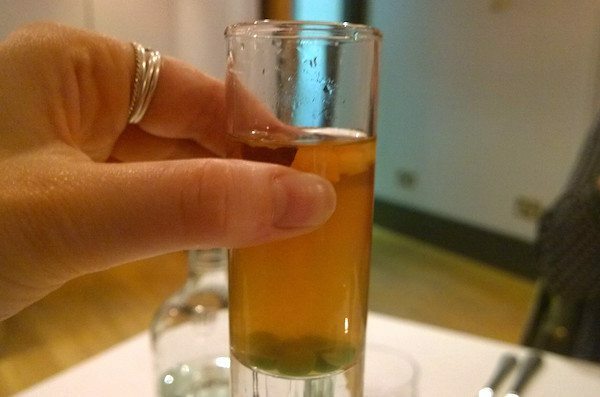 The consomme was blushing pink but was as clear as day, and had what looked like hand shelled peas in the bottom of the glass. It was sweet and had a lovely depth of flavour, and we enjoyed the finish of the sweet peas at the end. They had gluten free bread which is from the Sussex Bread Company, including their sourdough bread with a hint of caraway, and the mediterranean loaf which is packed with herbs, olives and sundried tomatoes. I can honestly say that if you did a blind tasting of this bread, you wouldn’t know it was gluten free! You know some restaurants by in the cheap, over sugary rice flour rubber bread and it’s not very nice at all. It’s nice to see that Drakes have sourced the best of the best for their gluten free diners. At the beginning of our meal we were asked if we would like to choose our own wine, or if we would like our waitress to match the wine with each course that we were having. I love a bit of wine matching, you get so much more out of the dishes, so we both agreed to go with that option. Our starters were brought to the table and the glasses of wine that were to match. I had chosen the pressed ox tongue with bone marrow and crispy garlic that was matched with a Marlborough Pinot Noir called Little Beauty. 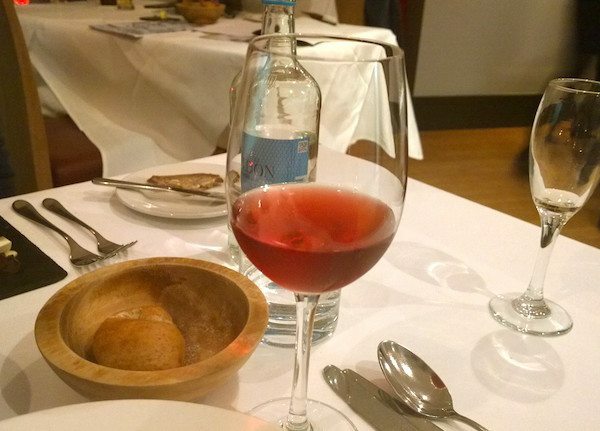 My friend had gone for the crab and salmon ravioli which was matched with a Claret Rose from Bordeaux. 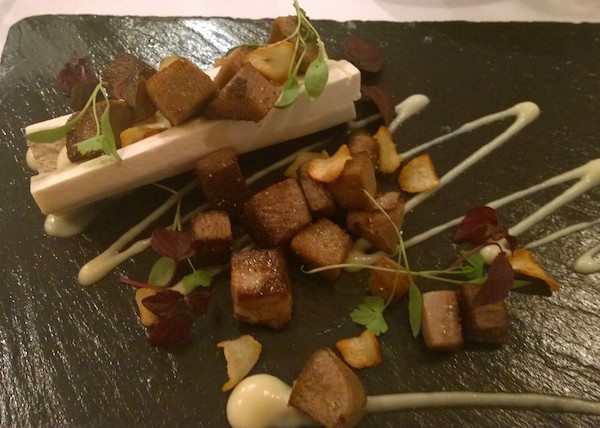 The ox tongue was something that I had never tried before, and it was absolutely beautiful. It was cubed and was slightly caramelised on the outside, and deliciously tender to eat. 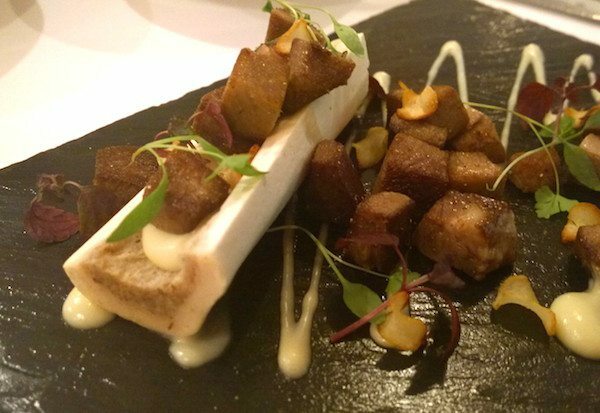 The bone marrow was smooth and silky, and presented elegantly around the plate, and the lovely slices of crispy fried garlic added a welcoming texture to the dish. Usually this would come with crunchy bread crumbs on top of the bone marrow, but as mine was the gluten free option it was omitted, and I really didn’t feel like I was missing out. The Pinot Noir had classic Marlborough depth, and slightly smoky, but the smoothness of the wine complimented the richness of the other ingredients on the plate. The crab ravioli is not a dish that is able to be made gluten free as it is pasta, obviously. It was bought out as a large singular ravioli, and the chilli broth was poured at the table in a cast iron teapot which was a nice touch. 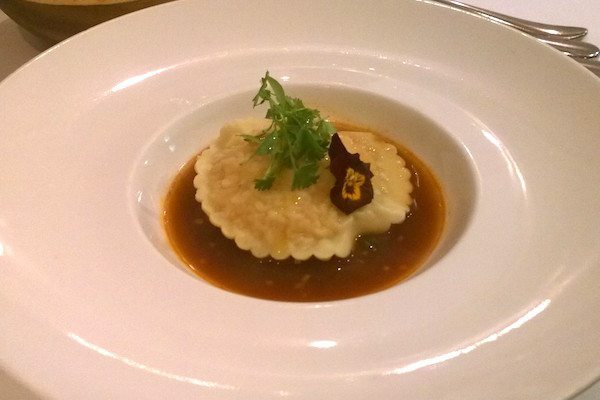 The aromas of the broth were enticing, and my friend said her ravioli was generous and full of flavour, and the micro coriander leaves on top really brought together the dish. I tried some of the broth with her wine, and the sweetness of the rose matched really well with the savoury broth, and I could imagine enjoying both in the sunshine on a warm summers day. Feeling content and nearly full, our plates were whisked away and tables swept for the main course. We were enjoying the company of our surrounding diners, there was still a friendly, casual feel about the place, while keeping up the finesse and elegance of a fine dining restaurant. The wait time before our mains was short, and these were brought to our table along with our new wines. Both our dishes were of generous portions, so don’t come here expecting to get a miniscule plate of food! Most of the mains were suitable to be made gluten free and I had decided to try the breast of guinea fowl with smoked bacon lentils and sweetbreads and my friend had gone for the pork which came with caramelised pig cheek, pork fillet, black pudding and apple – which can also be made gluten free but they would serve it without the black pudding. 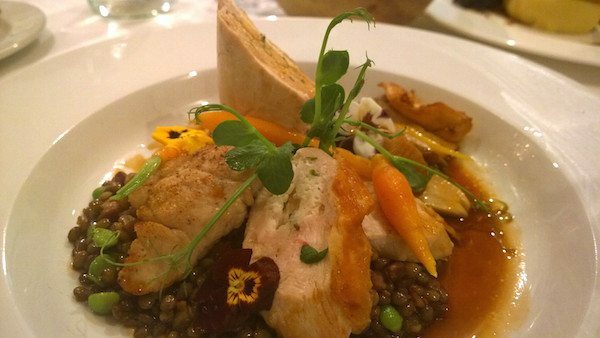 My guinea fowl was matched with an Austrian red wine, that brought out the smokiness of the lentils and the sauce on the plate. The breast tasted like it had been sous vide in a water bath until melt-in-your-mouth tender, and then pan fried to give it a crispy skin. The sweetbreads were soft and lightly browned on the outside – a great introduction if you have never had them before, and all of the baby vegetables were cooked to perfection. The pea shoots and pansy flowers gave the meal a spring like freshness, and contrasted against the warm, smoky bacon lentils which kept it a comforting dish. My friends pork was blushing pink, and the pig cheek just fell apart when it was touched by the fork. She said that the black pudding was light and fluffy too, and everything went really well with the creamy mash and the sweetness of the apple. The only green on the plate was crispy kale, but it worked as a comforting plate of food. The pork was matched with a Chateau Mangot from Bordeaux. We were both now feeling the effect of the wine, and all of the gorgeous food, and needed a break before dessert. We were brought the menus to look at, and I was explained that on the current menu there was only the one to choose from that was free from gluten, but they did have a couple of specials on that day that I could have if I wanted. The gluten free option sounded delicious, and exactly what I felt like as it sounded refreshing and sweet. 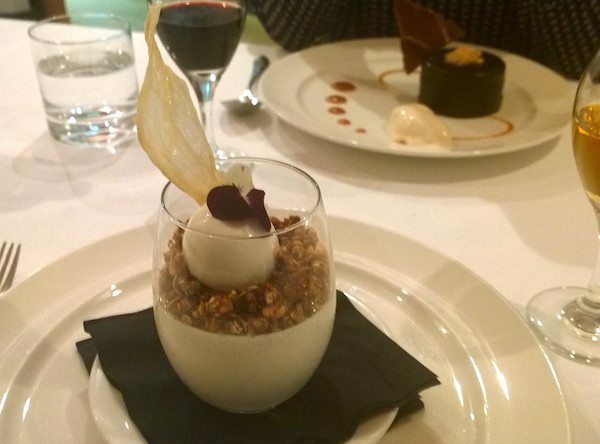 It was a yoghurt pannacotta with cocoa nib and hazelnut granola with a honey ice cream. A little bit like a breakfast for dessert, but as I said it was exactly what I felt like and also something different for pudding that you might not find elsewhere. My friend ordered the chocolate pave with salted toffee. 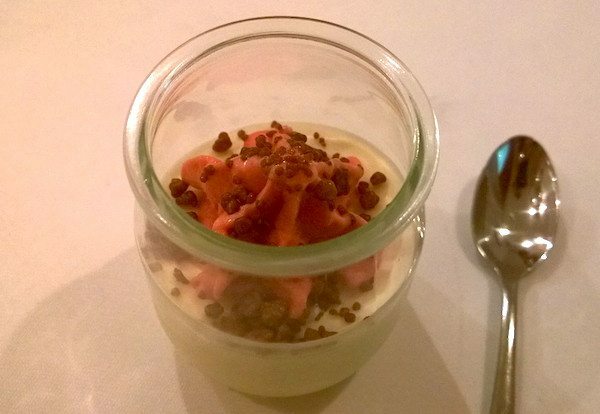 We had a short rest on request, and then we were brought a pre dessert of white chocolate mousse with raspberry sorbet and popping candy! 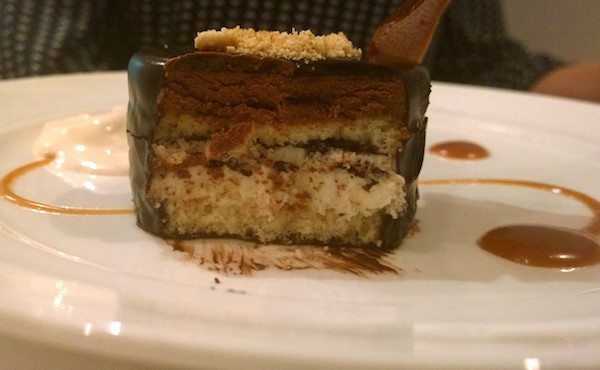 It was a fun and creative way to cleanse the palate before actual dessert, and it perked us up again from our slump. It was light and fluffy and perfectly sweet and refreshing. I wasn’t expecting it but we were given another wine to match our desserts, and I knew at this point I was going to feel foggy for work tomorrow. Of course, it was all going to be worth it! My panna cotta was served in a glass and topped with an edible flower, and a perfect quenelle of honey ice cream on top. The wine it was served with was and Albia Chiara from Italy, and had rich peach and stone fruit flavours so it went really well with the panna cotta and granola as you would imagine. A chocolate pave after much research is a French word for paving stone, and is traditionally made with layers of mousse or cake, but is rich and dense and best served in small portions. Drakes version was this at it’s best, however it wasn’t gluten free which was sad for me. After cutting through with a spoon you saw the intricate layers of white chocolate mousse and fluffy cake layers, and it was coated with a chocolate film and served with what I would say is the nicest salted toffee I had ever had. There was an amaretto biscuit crumb sprinkled on top, and it was served with a quenelle of vanilla ice cream on the side. It was very rich and I would recommend sharing if you are feeling full like we were! This was served with a Italian fortified red wine, and it really was a treat. After we couldn’t fit any more, we graciously thanked our excellent waitress and the chef, then I walked out to where I thought it was the door and it was actually the kitchen! I had obviously had too much wine and it was definitely time to leave, so we thanked the staff again and walked out to the fresh air giggling with satisfaction. As you can probably tell, we had a wonderful evening at Drakes Restaurant, and there was no point that I felt like I was missing out by having to eat gluten free. They were hospitable and knowledgeable, and I would highly recommend visiting Drakes for your next date night or treat. 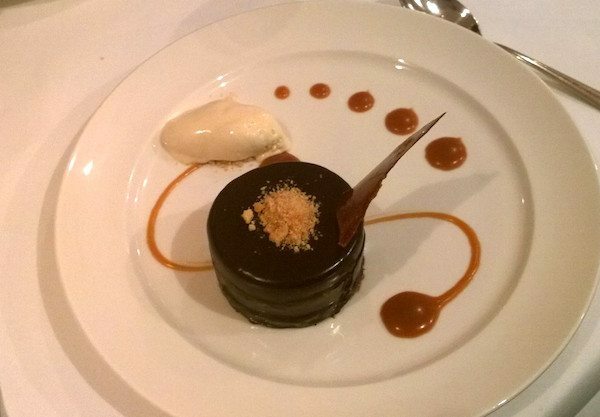 I wouldn’t be surprised if we see the kitchen sporting Michelin stars very soon….